BELFAST, Northern Ireland — Mitchell Fossier scored the eventual game-winning goal 35 seconds into the third period on Saturday to pace the University of Maine men’s ice hockey team to a 4-2 win over Rensselaer Polytechnic Institute at the SSE Arena. With the win, Maine (5-7-0) secured third place in the 2017 Friendship Four Tournament. The Engineers slipped to 2-9-3. “Today’s a hard day, because we had a pretty quick turnaround,” said UMaine coach Red Gendron. Two freshman goaltenders in Maine’s Jeremy Swayman — who had a solid glove save on a tight shot from the left circle — and RPI’s Linden Marshall were able to handle the shots thrown their way early. Maine continued to create opportunities throughout the period and the Black Bears’ persistence finally paid off with 6:04 to play in the first. After Canon Pieper picked the puck off near the red line, he sent a pass to Brendan Robbins in the high slot. Robbins skated past one defender before cutting to his backhand and roofing the puck past the stick of Marshall. “Our first goal was perfect execution of the neutral-zone forecheck and then counterattack,” Gendron said. The Engineers capitalized on a power-play opportunity as the clock ticked down in the opening frame, with Troy York pulling the home team of the day even with 12 seconds to go. Nolan Vesey put Maine back on top when he found the net just 1:41 into the second period. After Alexis Binner picked the puck up behind the Maine goal line and fed it up to Brady Keeper, who then chipped it into the neutral zone to Patrick Shea. Shea’s centering pass found Tim Doherty and then Vesey finished off a dish down the left wing by tucking a wrister inside the far post. “I think he surprised the goalie how quickly he shot the puck,” he said of Veazie. The Black Bears carried that momentum into the final period and Fossier found the net just 35 seconds in. After Eduards Tralmaks worked the puck to Patrick Holway at the right point, Fossier cut to the net and tipped the defenseman’s shot into the net for the 3-1 lead. “We gutted it out, scored a big goal early in the third period to have that two-goal lead,” Gendron said. The Engineers scored four minutes later to make it a 3-2 contest with 15:07 to play. The Black Bears defense and Swayman stood tall the rest of the way with the goaltender making a couple glove saves, including on the penalty kill with under three minutes to go. Even after RPI pulled Marshall in favor of an extra attacker, the Black Bears stayed tough and Doherty added an empty-net goal for the final 4-2 score. Swayman (4-3-0) finished with 18 saves while Marshall (1-4-1) had 23. Maine held the final edge in shots on goal (27-20). 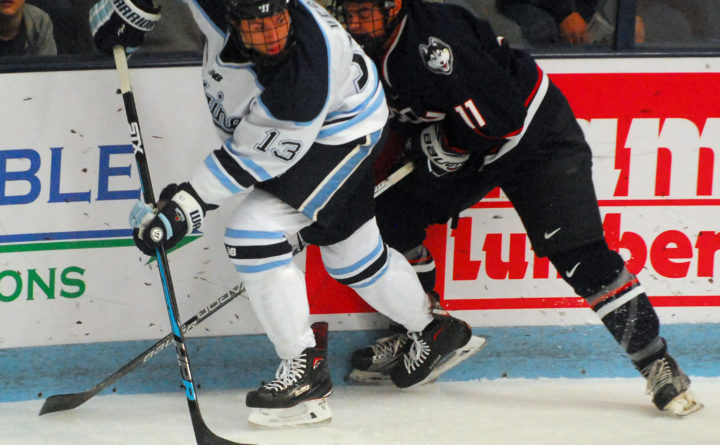 The Black Bears are back in action next weekend when the Vermont Catamounts visit Alfond Arena on Friday, Dec. 1 and Saturday, Dec. 2 for two Hockey East tilts.